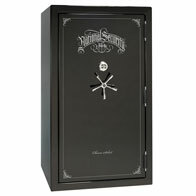 National Security Gun Safes - Amazing Prices! "When you want the best, look no further. 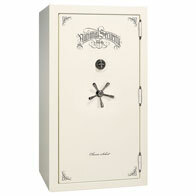 National Security gun safes have superior features pioneered by Liberty. Their hallmark ultra-premium finishes and innovative designs leave other manufacturers struggling to catch up." Safes in the National Security line are the ultimate safes, a perfect blend of form and function. Compare them to lesser units and you'll find that the more you look, the better National Security safes look! Beware the gray market! Dean Safe is an Independent Factory Authorized National Security Safe Retailer. 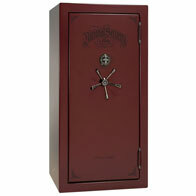 The Liberty Accessory Door Panel is standard and factory installed on National Security safes. It features quick-draw holsters, zip pockets, choke tube holders, and the cool pocket. The zip pockets are ideal for storing ammo or any other valuables. It keeps them secure and contained in a pocket that zips so that your valuables will not be knocked about. The cool pocket provides storage for letter size documents, cash, passports, etc. and even provides extra fire protection. The quick draw holsters have a soft lining and are designed to hold most handguns. Although they can not be repositioned, they do come in handy and keep your handguns from cluttering up the shelves in your safe.